The main selling point of many of the cars that cross Mecum’s auction block is the showroom-new, all original condition they are in. 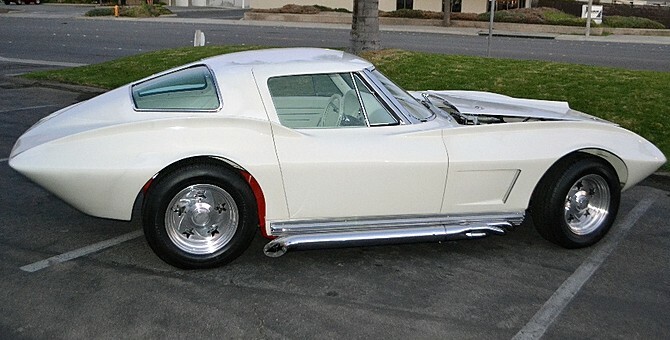 But this 1963 C2 split-window Corvette set to go under the gavel at its Anaheim auction makes no attempt at concealing its extensive modern-day modifications. The car was built by legendary custom car builder Ray Fahrner in Kansas City. Fahrner added his own custom touches to the body, reforming the front fascia, adding an aerodynamic extension to the front and rear wheel arches and shaving off the door handles. There are also unique wheels with star-shaped cutouts and side exit exhaust pipes. The interior retains the same layout as a showroom-new C2, however the seats and dashboard have been completely reupholstered with white leather. There is also contrasting red carpeting, a billet steering wheel and shifter and chrome touches throughout. Under the hood is a 350 Chevy Small Block with custom chrome touches mated up to a Muncie 4-speed close ratio transmission. The suspension has also been entirely redone with matching red and chrome pieces. Catch this car, lot #S52, as it crosses Mecum’s Anaheim auction block on December 4. Over 750 vehicles will be auctioned off at the event, which will be aired live on NBC Sports.